Asian lady beetles were introduced in the U.S. in the 1960s as a governmental attempt to control plant pests. Since then, the bugs have spread through much of the United States and Canada. Asian beetles are harmless to humans, although they do occasionally pinch or bite. Scientists believe the beetles are actually testing for moisture in their environment, and no venom or diseases are spread through these bites. The beetles do leave a yellow substance behind upon their death, and they are known to have an unpleasant odor, so you probably want to keep them out of your house. 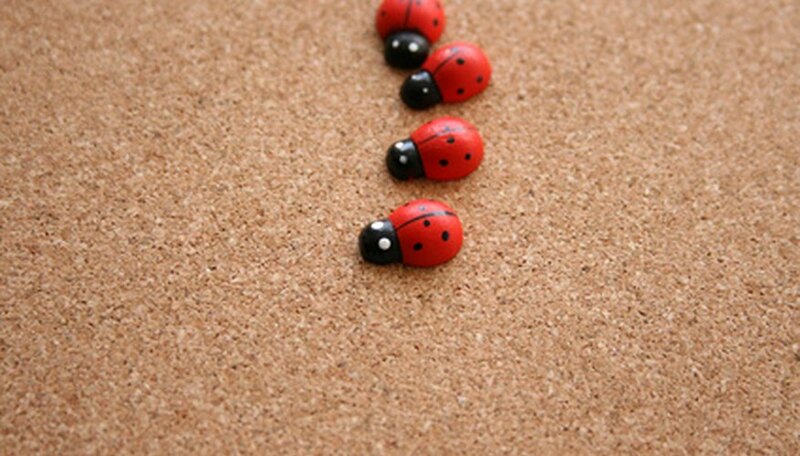 Asian beetles or lady beetles look a lot like native ladybugs. The Asian beetles are oval, about a quarter of an inch long and red to orange in color. Some have black spots on their wing covers, while others have no spots at all. Asian beetles have a whitish area behind their head with an M-shaped marking, usually in black on top of the white area. In the fall, the beetles leave their outdoor summer feeding sites and seek shelter indoors, usually in the walls of houses and buildings. They like illuminated surfaces and are usually found at windows on the southern sides of buildings. Although the type of home does not seem to matter the beetles, contrasts of light and dark do attract them, according to the University of Kentucky Extension Service. Homes with dark trim on a light background or houses in the woods or near fields, for example, are often subject to infestations. Window frames aren't the only place the beetles are found. They often work their way into door frames, fascia boards, siding, attics and spaces in walls. The most effective organic method for repelling Asian beetles is to simply seal up any cracks and openings in your home. This prevents the beetles from finding a place to get in. Look for cracks and openings around the outside of your home, particularly around windows, doors, soffits, siding, boards, utility pipe, cable entries, and wires. Use caulk or silicone sealer to fill the cracks. Cover large holes with wood or plug the hole up with spray foam or cement. Repair window screens and screen doors, and staple screen material behind attic, dryer and stove vents. The gaps must be absolute, as the beetles can squeeze through spaces of an eighth inch or even less. Doing this will also prevent many other bugs from entering your home. Camphor and menthol can provide an additional organic barrier against an Asian beetle invasion. Camphor is a tree native to Asia, in particular China, Vietnam and Japan, although it is found all over the world. Its oil is an organic Asian lady beetle repellent. Menthol is an organic compound created from mint oils and has anesthetic qualities. Researchers with the Chemicals Affecting Insect Behavior Laboratory in Beltsville, Maryland, determined that the vapors of both camphor and menthol were enough of an irritant to the beetles' chemosensory organs that the bugs were repelled. Menthol and camphor oils can be purchased, mixed with water and sprayed in areas where Asian beetles tend to congregate.